Editor's Note: Rare gain could have turned $10,000 investment into $1.4 million – discover the ONLY type of stock that could also deliver incredible profits today. The U.S. Senate voted in favor of a bill on June 25 that would allow U.S. military veterans to receive recommendations for medical marijuana from government doctors. It would also protect veterans from losing their government benefits as a result of cannabis use that is legal under state law, according to MarijuanaMoment.net. The bill still has to make its way to U.S. President Donald Trump before it becomes law. 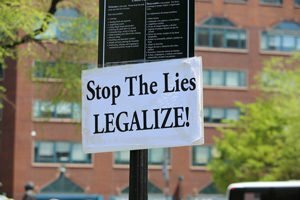 But with 64% of Americans wanting cannabis legalization, the government may finally start listening to the will of the people. Maryland voted for a pro-marijuana candidate for governor this week. Ben Jealous won the democratic nomination, and if elected, he would use cannabis tax revenue to fund pre-K education throughout the state. Investors are speculating that Canadian brewer Molson Coors Brewing Co. (NYSE: TAP) may be getting into the marijuana business. Bloomberg reported on June 25 that the beverage giant is considering a move into cannabis-infused beverages in Canada. Though the report hasn't been confirmed by Molson, a company presentation on June 6 said that it was exploring the opportunities and risks of entering the market. Justin Staples, a former NFL linebacker, is starting a new career in the cannabis industry. He was hired as the Director of Business Development for Revolution Enterprises, according to a June 27 Forbes report. "I'm joining the Revolution Team at a true industry inflection point because my values align with Revolution's success in providing Illinois patients cannabis medicine as an alternative to addictive opioids," Staples said in the Forbes report. When the NFL's collective bargaining agreement expires in 2020, some believe the league will update its policies and allow medical marijuana for pain management. I would like to know why no one shows a newbie how to find and setup a brokerage account?